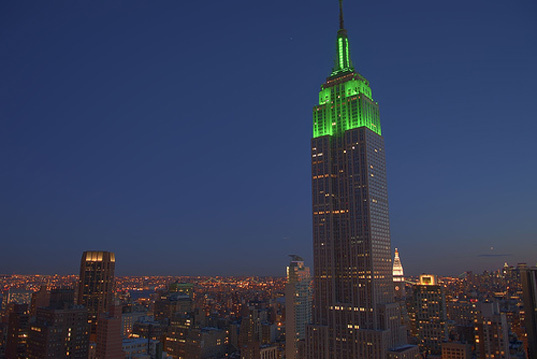 After a $100 million green renovation that took more than two years, the Empire State Building has been awarded LEED Gold certification, making it the tallest building in the United States to be LEED certified. Everything from the windows to the bathroom fixtures to the heating and cooling system was upgraded, and eco-friendly practices and a new recycling program were incorporated into the building’s operations. The results are expected to reduce the building’s energy consumption by more than 38 percent and save $4.4 million in energy costs, proving that green buildings don’t have to be new buildings. After a $100 million green renovation that took more than two years, the Empire State Building has been awarded LEED Gold certification, making it the tallest building in the United States to be LEED certified. Everything from the windows to the bathroom fixtures to the heating and cooling system was upgraded, and eco-friendly practices and a new recycling program were incorporated into the building's operations. The results are expected to reduce the building’s energy consumption by more than 38 percent and save $4.4 million in energy costs, proving that green buildings don't have to be new buildings.